This is good news for DD Freedish viewers that Prasar Bharati going to held its 38th e-auction for filling up vacant slots on DD Freedish DTH platform. All private TV channels are invited to take part in this e-auction under new revised policy. 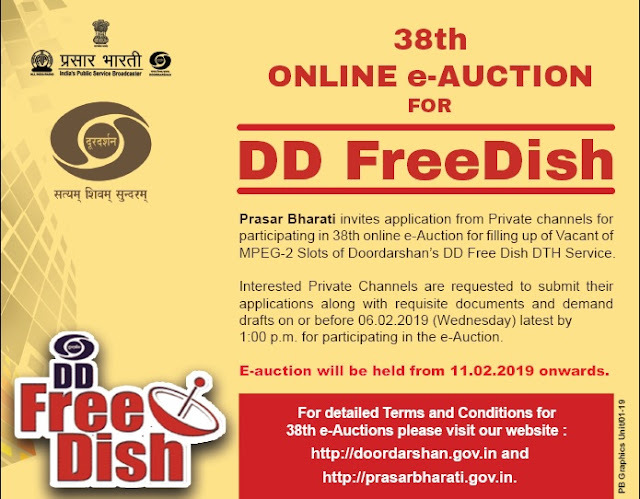 Doordarshan will conduct the 38th online e-auction for filling up of vacant slots of DD Free Dish DTH Platform by private TV channels from 11th February 2019. In this auction, only those satellite can participate which has valid licensed from ministry of information and broadcasting. This e-auction will be different from previous e-auctions held because now new revised DD Freedish policy applicable. According to new revised policy, this e-auction will have different pricing for slots. Because now TV slots are split into five buckets and reserved for specific genre or language. New pricing are according to five buckets from Rs.6 crore to Rs.15 crore. 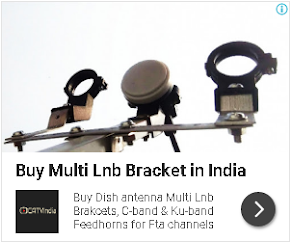 It means now DD Freedish have TV channels from other languages as well. If you remember, the last e-auction was held in July 2017, which was also split in 2 buckets (Non News and News Channels) but now it is categories in 5 buckets. This revised policy enhances its reach to non-Hindi speaking states and main advantage will be that now new TV channels (other languages) will be available here soon. Lots of DD Freedish viewers asking question in comment section of freedish blog that what will happen after implementing of TRAI rules in next month?. But don’t worry, Prasar Bharati CEO Mr.Shashi Shekhar Vempati already informed in Rajya Sabha channel that “DD Freedish is a public broadcaster; there is no subscription fees so rules will not be applicable on this platform. Please add any kids channel. Please add a channel for kids. I think, doordarshan should launch a hindi movie channel without showing any advertisement. Another movie channels show lot of advertisement between movie. So do not want watch movie in paid channels. Please add NDTV NEWS Channel. Hello plese add bengali channel on dd free dish,like star jalsa,zee banglaetc. please add sports and kids chanels.plllllllzzzz. History tv 18 ko jodne ka paryaas kijiye... .
On 1/3/2019 TRAI neglected to pour consumer.becaus no have an entertainment channel.what showing pour consumer in dd free dish? plz add mh1 ,pitara,and ptc chakde,and some kids channel and some arrange educational or business related programs for the development of the new young ones,youth&socity. Sir Ham sab itna hi chahte hai ki jo free to air channel hai usse dd free dish par dikhya jaaye. parsar Bharati kaho ki 190 channel jab free to air use par dale..